The Samsung Galaxy S3 has an L.E.D. to the left side (when the phone is facing you) of the earpiece. It is used for notifications so that owners will know that messages came in, they missed calls, the phone needs to charge, etc. without even touching it or unlocking the screen. IMPORTANT NOTE: The LED indicator will light up only when the screen is off. Pulsating is different from blinking. It means that the LED is lit longer or shorter than it is off, thus, creating a noticeable rhythm. Blinking, on the other hand is a steady turning on and off of light. Now the LED indicator will emit pulsating multi-tone blue light if the phone is either turning on or off. This happens every time you restart your Galaxy S3 or turning it On from Off and vice versa, unless LED indicator was disabled. I received a couple of emails asking me how to fix an S3 that doesn't turn on but pulses blue light. This problem could be a glitch, a minor one, and it can be rectified by pressing and holding the Volume Down and Power buttons for 20 seconds. This will stop the pulsating blue light but doesn't turn the phone on; you need to do the usual turning on procedure to do so. Another owner asked why his phone doesn't pulse blue light during reboot, turning on or turning off. It's not really a problem, it's just the LED indicator was disabled or blocked. To enable it back, go to Settings > My device > Blocking mode > unmark Turn off LED indicator. Your phone will blink blue if you have any sort of notifications that you haven't read or dismissed yet. This includes SMS and MMS messages, emails, missed calls, and other notifications from apps. Another thing that makes the LED indicator to emit blue light is when the voice recorder is active or recording. Question: I have notifications that I want to read tomorrow morning but I just want to sleep tonight without dismissing those notifications. How can I stop the blue light from blinking? Answer: Disable or block the LED indicator. Go to Settings > My device > Blocking mode > tap the slider from Off to On > place a check in Turn off LED indicator box. The glowing red light happens when you plug your phone in to charge and is charging normally regardless whether you're using the original power adapter or it is plugged in to your computer or laptop. To make it easy to remember, think of this: the red color always means urgency or something that needs immediate attention. One thing that needs your immediate attention in your Galaxy S3 is the battery. It is the only hardware component that 'runs out'. Question: My phone is plugged in but it doesn't show red light. Answer: First, check if the phone charges when plugged in. If it didn't charge, that could be the reason why the LED indicator didn't light up. If, however, the phone charges fine but the indicator doesn't glow even if the screen is off, then make sure the LED indicator is enabled. If your phone blinks red, it means it's low on battery. When you plug the phone to charge and the red light continues to blink, it means it cannot detect the charger or there's no electricity flowing to the phone. There's a possibility your power adapter is busted or there's a break in your cable. To troubleshoot the problem, use a different charger and cable. If the phone shows glowing red light but the battery indicator shows there's more than 10% left, reboot your phone. If the battery indicator didn't change after the reboot and the LED indicator still blinks red, there's a possibility the problem is with USB charging port. For this, you need to employ services of a technician. If you can see the LED notification glowing green and the phone is connected to the charger, then it is finished charging and the battery is full. 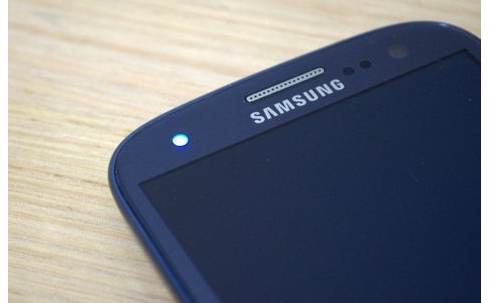 There's no other meaning of the glowing green light on the Samsung Galaxy S3. That's all as far as LED Indicator is concerned. If your phone is emitting light other than ones I mentioned here, then there's an issue with it. The first thing I want you to do is uninstall Light Flow if you've got it installed or other apps that has the ability to manipulate the LED indicator. If the problem persisted, feel free to contact me via harold@droidista.com or join the Smartphone Support community I created for this purpose.